'The Descendants' actor is currently holidaying in Lake Como, Italy, with his girlfriend Stacey Kleiber and black cocker spaniel mix Einstein, who he enrolled in local pet grooming centre Comodog. Einstein has also joined his owner on the boating lake, as well as enjoying the Mediterranean weather. George rescued his pet from a shelter in Los Angeles, and when he first got him Einstein was overweight with dry eye and an underactive thyroid, and had been living in a "filthy, crowded dog run." 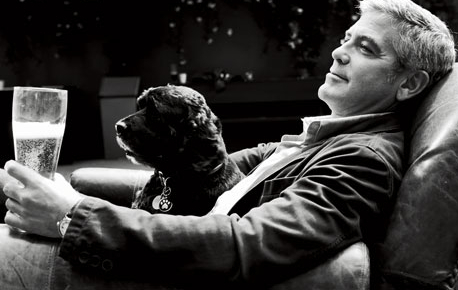 George said he won the dog over the first time he met him, through the clever application of some meatballs. He said: "I start to panic that Einstein is not going to like me. So I run into the kitchen, where I have these turkey meatballs, and I rub them all over my shoes. "This woman opens the door, and who knew Einstein was such a food w***e on top of everything? He throws himself at my feet."